When it comes to delivering professional-level tools in a consumer grade application, MAGIX Movie Edit Pro is one of the best video editing software one can choose. It’s so easy that it doesn’t intimidate the novice user. This is important as it opens up a new set of possibilities to the creative mind. The major difference between this software and other video editing software is the innovation termed as “object-based editing” by MAGIX. In every other application, each element has dedicated tracks on its timeline, as the video goes on one track while the audio goes on another, and so on and so forth. The tracks in this application are basically different in that you can put any type of media on any track. This in turn dramatically changes the way you deal with the timeline. It also streamlines the workflow and also allows editors to build projects using fewer tracks. Another advanced aspect is also known as proxy editing. This is used in the case when you are dealing with the higher-resolution footage. As high-resolution footage takes a bit long time to render, this software also creates lower-quality copies for you to work. When you are ready to export the project, the high-resolution counterparts are used to create your final product. This saves a lot of time and is found on few other video editing applications. A tool which also please filmmakers is the ability it provides to automatically sync video and audio files that are also recorded on separate devices. This program analyses the waveforms for you and automatically syncs different elements. This video editing program also has a mobile version which is called MAGIX Movie Edit Touch. It is not nearly a full body software like its desktop counterpart, but it allows you to crop and trim footage, export video in full HD and even add transition effects. This mobile app is available for smartphones working on Android and Windows OS. This program has two main editing modes: The Storyboard Mode and the Timeline-Editing Mode. In the storyboard mode, it sets out all of your elements of the story in the order in which they will be taken into use. This also makes it easier to rearrange your footage, add effects and transitions in the order you wish them to appear. In the timeline-editing mode, the experienced editors can find all the granular tools any professional use to create the movies of top quality. The trailer template mode is the one minor editing mode we like to let you know. These are a series of templates that have cuts, music, and transitions already in the place. All you have to do is drag and drop the footage into the template. Once you are finished creating your video project, you will have some options for sharing your work with an audience. This program handles the various aspect of video such as aspect ratio and resolution, frame rate, etc. It takes care of simple and advanced control nicely. You also get the option to burn your videos on a disc. You can burn DVDs, Blu-ray discs, and AVCHF discs. You can also upload videos directly to sharing sites like Facebook and YouTube. With multiple online avenues, you can easily train yourself to work on this software. The major one is MAGIX.info. This is a dedicated online community of this program’s users. It allows your to get in touch with other editors, filmmakers to learn and share your videos along with enhancing your skills. 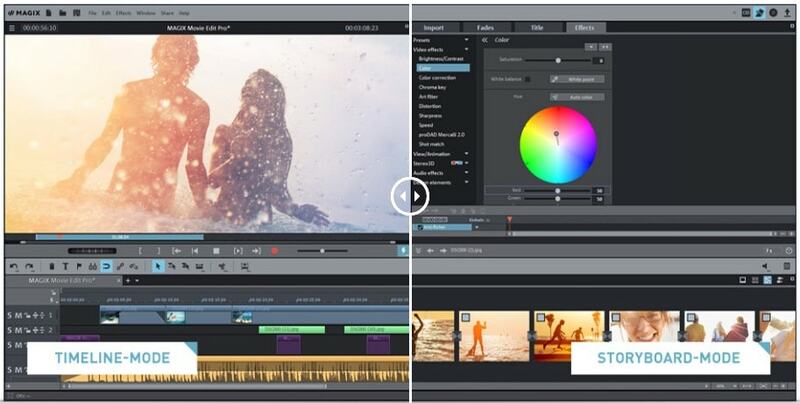 MAGIX Movie Edit Pro is among the best video editing applications available on the market. Its advanced tools like object based editing, proxy editing makes it a must-have product for both new and experienced video editors.